Santa is a good friend of CWFFarm. He heard we were having Christmas from the farm at the Columbus Winter Farmers Market. 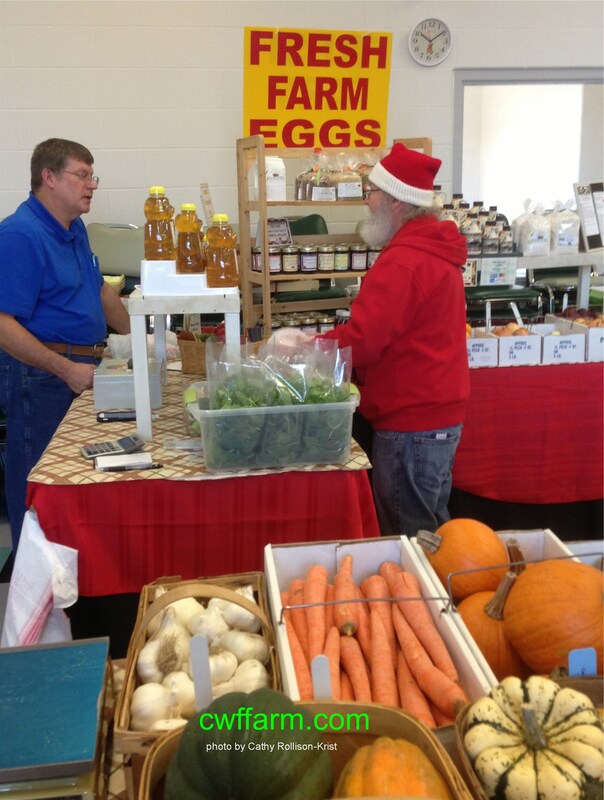 Santa said he had a hankering for some farm fresh vittles so he stopped by to pick up some eggs & veggies today. We hear tell he is gearing up for a big Christmas eve to visit all the girls & boys across the world. You should have heard how excited my ladies (chickens) were when I returned home tonight and told them Santa said he needed some hearty breakfasts to keep up with his busy schedule this week. The ladies were delighted their eggs were on Santa‘s wish list so he could eat hearty in preparation for a busy Christmas season. They were still cackling when we finished the chores & closed the barn. Santa said he’d stop in on his way over the farm and tell the ladies Thank-you! He is a jolly ole man! Thank you Santa we enjoyed the visit today!